"I met a Guardian once, a Warlock, his Ghost said he found him on a deserted Island called Guam. Records showed it was a territory of what was once called the North American Empire. The island was the country's far-east Air-force/Naval Hub for the old Oceania/Asia Region,closer then the Nalval Hub in Pearl Harbor, Hawaii and the Air-Force/Naval Hub in Alaska in . When the Darkness came the military forces stationed there fought with what it could, but sadly it was cut off from the mainland far east and even their closes Naval Hub Hawaii which was 3,900 miles away was isolated due to the onslaught of the darkness all over the world , they couldn't evacuate a single person from there or their sister islands Saipan,Tinian and Rota. His Ghost said he talks to himself from time-to-time, mumbling about a mother and father as well as siblings. Maybe I should pay a visit to him, for study of course..."
Baby Blue, know to reflect the past and present child within. Known to have skills in navigating Silver and Golden Age computer tech. Guahanboy 98 is an Exo Warlock. He is a veteran of the Taken War and a member of the Future War Cult. He is also one of few Guardians who loves Master Rahool for his trolls of Legendary Engrams for low-tier loot. He is known to frequent the Cosmodrome and Mars to relax and cull the Darkness's herd of minions to keep his skill sharp. During the days after the destruction of the soul of Crota, Son of Oryx, as well as the failed reunification of the Fallen Houses by the psuedo-Wolf Kell Skolas, Guahanboy 98 had just recently been revived by his Ghost in the Island of Guam, in forgotten territory. He fought his way back the the Last City to be greeted with the strange but welcoming faces of the Vanguard and the oh-so-mysterious but kind and gentle old man known as the Speaker. He had quite the first day and interesting things to come in his time as a Warlock. Do to him just being recently revived he had been taught and trained in combat by the Vanguard Warlock Ikora Rey and Crucible Handler Lord Shaxx. Ikora had taken an interest in the young synthetic Warlock for his surprisingly great thirst for knowledge into the three subclasses a Warlock can wield. She had humored him by giving him data fragments from the dead Ghosts of the many skilled Warlocks that come before her. Soon she found no more to give him, so he went on his way to discover more but not without sharing and consulting his findings with his senior. The other, Lord Shaxx, had been taken by the Warlock's sometimes shy and timid yet deadly and skillful personality. Hoping to get some insight into how he ticked, the Titan had invited the young warrior of Light into the Crucible Arena Matches, and what followed still surprises him to this day. The Warlock had below average skill in most of the game types including the Rift game type, a game type specificly favored by Warlocks, except one he shone in. Clash was mostly played by Titans and Hunters to sharpen their skill and also to relieve some stress from lack of missions. 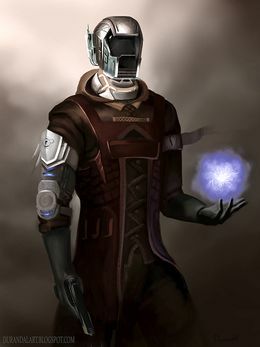 Shaxx saw the Warlock as a team player;playing to the environment's advantages, and soon came to respect the Warlock and had asked if he could accompany him on any missions out of the city. Guahanboy had heard of Lord Shaxx's deeds during the Battle of Twilight Gap as well as his love of fighting from other Crucible participants and had come to greatly respect him, so agreed to his request. "May we survive this Long Night Guardian. Good luck and may the Traveler guide you always." During the early days of the Taken War Guahanboy-98 was doing his patrols in the old Cosmodrome, on the borders of the territories reclaimed by the City and the Fallen House of Devils. He was a first responder to a distress call from a fireteam who were last reported to be scouting the entrance to the The Devil's Lair. While on his way to the area there were sounds of fighting coming from the location. He had snuck into the hallways while dogging hordes of Fallen who were running to the area the Fireteam distress signal was coming from. Wondering what was going on he booked it to the location and perched himself on top of a shack, scouting the chaos that he described as a warzone. Fallen and some sort of corrupted Hive forces were battling it out. Worried about the fireteam he weaved and dodged around the battlefield, Arc and Void bolts either flying over or at him from both sides as he made his way to the entrance. He found them, badly wounded but would live. He moved them to a good vantage point and requested for emergency EVAC from the area, he thought he was going to hold out on his own. Lucky for him he wasn't the only one who had heard of the distress signal, 5 other Guardians had arrived on scene, fighting their way to them. They had made it to him and the downed fireteam but needed to hold out. The Fallen had been pushed to the entrance of the location. The corrupted Hive had taken position all over the area and had smelled the Guardians. Concentrating on holding out he had remembered that his super ability Sunsinger was fully charged, Guahanboy-98 switched to his most trusted weapons at the time. A Fang of Ir Yut fully ascended and a Vestian Dynasty full ascended as well. Due to there being more hands available they were able to move the down fireteam to the entrance of the Devils Lair. They hunckered down at the entrance and took positions at the entrance and a blast hole higher up the wall of the entrance. The Hive were getting closer and would have soon overunned the Guardians had it not been for FOC Hawks coming over the wall of the area and dropping FOC battle Frames and extracting the Guardians. When they reached the tower the fireteam was taken to the Med-bay. Cleared and patched up the other Guardians and Guahanboy-98 were directed to see their respected Vanguards for an important briefing. The Vanguard had reported that a Guardian had found that the Cabal forces all over the SOL System had taken a massive hit from an enemy they had only heard in rumors, Oryx, the Taken Kingand his Taken Army, soon reports started flooding in of Taken spawning all over the Solar system, fighting Vex, Cabal, Fallen and City forces. The Cryptarchs soon dubbed this event as the Taken War. Sadly do to Taken elements still lurking around the Sol system Guahanboy-98 could not aid Lord Saladin Forge in his fight against the Fallen House of Devils. But he did help in relaying info to Shiro-4 about SIVA cluster siting around the other parts of the Cosmodrone far away from the Plaguelands from him and other Guardians.